The first batch of pilgrims to Kailash Manasarovar via Nathula border in Sikkim has successfully completed the pilgrimage tour. The batch of 33 pilgrims including two liaison officers returned back to Gangtok on July 1 after successfully completing the tour. They left on June 20 for the pilgrimage tour from Gangtok. They received a warm welcome on their successful return to Gangtok by the Secretary to Tourism & Civil Aviation Department, CP Dhakal by presenting mementos to all the pilgrims. 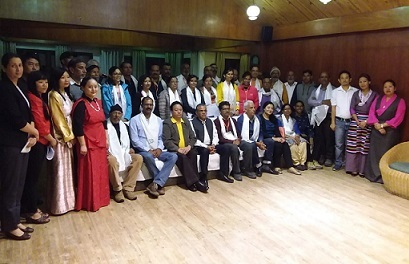 The Secretary to Tourism & Civil Aviation Department congratulated the pilgrims for successfully completing the pilgrimage tour and further urged them to convey the message of the pilgrimage tourism and hospitality of Sikkim to others who are interested in Kailash Manasarovar Yatra via Nathula. The first batch of pilgrims for the Kailash Manasarovar Yatra 2018 was flagged off from Gangtok by the Additional Chief Secretary, Government of Sikkim, SC Gupta. This was the fourth year of the pilgrimage tour from Sikkim. The first batch of 33 pilgrims included 24 male and nine females including two liaison officials. The Additional Chief Secretary welcomed the pilgrims to Sikkim and stressed upon the importance to follow rules and regulations and to cooperate with each other and the supporting staff during the tour.